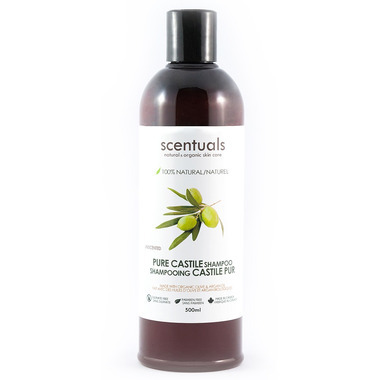 Scentuals' Pure Castile Shampoo is a rich lathering formula fortified with pure essential oils. It’s the perfect natural alternative to everyday conventional shampoos. Handcrafted with Organic Argan, Olive, Coconut and Castor oils as well as pure essential oils to make hair feel luxuriously soft and manageable. Say goodbye to dry, frizzy hair and hello to hair that looks and feels vibrant, healthy and silky smooth. The unscented formula is perfect for scent-free work environments. Organic Argan oil: Contains essential fatty acids and antioxidants to nourish and hydrate follicles, encouraging stronger hair. Organic Aloe: Helps repair damage and dryness while soothing scalps. Coconut oil: Softens, nourishes and protects hair and scalps with rejuvenating essential fatty acids.